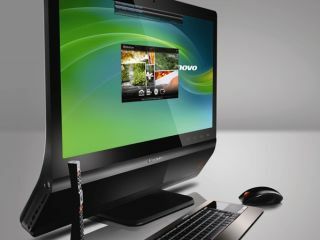 Lenovo has shown off its latest Idea PCs, including the rather nifty looking all-in-one desktop PC - the IdeaCentre A600. Among the new Lenovo products are the Y550, Y430 and Y650 laptops – with the latter claiming to be the 'thinnest and lightest 16-inch laptop in its class'. Also worthy of note is the IdeaPad S10 netbook, which boasts instant-on capacity and facial recognition software. But is the Lenovo A600 that may well receive the most admiring glances, with the glossy piece of kit the first all-in-one that Lenovo has attempted. And they aren't doing things by halves with the A600 boasting a 21.5-inch frameless screen, claims of being the thinnest all in one on the market and the now de rigeur 16:9 screen. Add in the Dolby Home Theatre audio certification for the in-built speakers, optional Blu-ray player, digital TV tuner, and many other options including a 4-in-1 optional remote control/game controller and an air mouse and you have a nifty machine indeed. Of course the sharper eyed among you will have noted the number of 'optional's and 'up to's in that specification, which will mean that you appreciate the entry level $1,000 machine may not be quite so feature-packed.